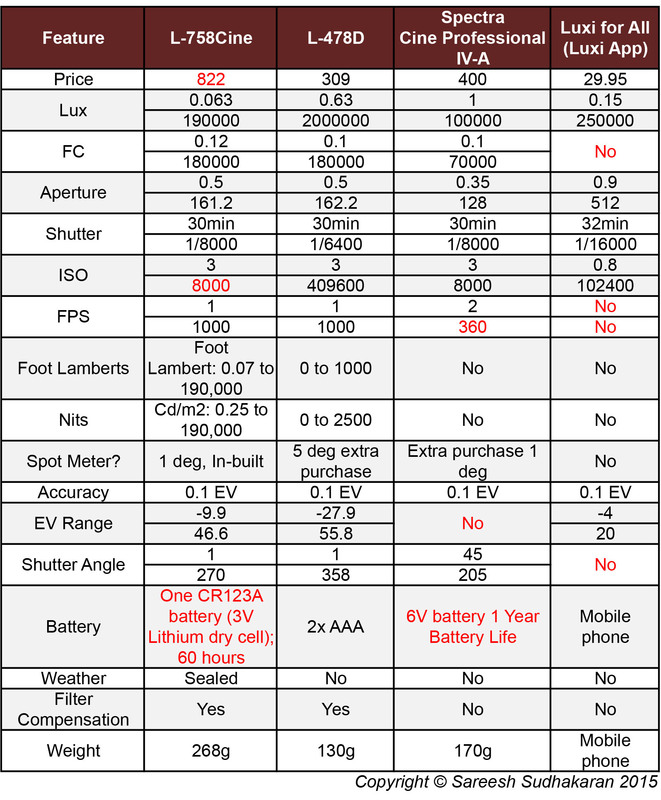 I have already written about why a light meter is important, and I’m in the market to buy one. So I thought I’d do a comparison and share my results. What am I looking for in a light meter? I’m going to be using it primarily for lighting on location. I’ve avoided the Sekonic L-398A (about $200) because it doesn’t cater to high ISOs. I’ve avoided the Sekonic L-308DC (about $270) because the price isn’t too different from the more modern L-478D. I didn’t consider the Lumu due to its high price. Prices and specifications may be wrong or inaccurate. Please refer to manufacturers websites for correct information. I am not responsible for any decisions you take based on the above chart. Some features have different ranges based on whether flash, cinema, etc., modes are used. Some are display ranges while the other are ‘true’ ranges. It’s hard to tell which is which without actually testing them side by side. One big negative of the Luxi for All is that it cannot be locked into place on a mobile phone, and any slight misalignment will cause a wrong reading. Which one am I buying? It’s actually pretty obvious. The L-758Cine stops at ISO 8000 and uses a hard-to-find battery. The Spectra Cine has a hard-to-find battery (though with an excellent battery life) and stops at 360 fps. The utility of the Luxi depends on the app, so another app might offer better features. However, not all apps are available on Android, which is sort of a deal-breaker for me because I own a Samsung S5. As far as the current Luxi app is concerned, it is too rudimentary but still a great deal for the price. My needs are just more demanding. All said and done, the L-478D is probably the only meter that checks all the boxes. There are two things I don’t like about it. Firstly, you can’t use a 1º spot meter with it. The 5º degree spot meter is near worthless, but I can live with it, because the internal meter on my Sony A7s is a 1º spot meter, so I’m okay. Secondly, it has a crappy touch screen, but there are no major horror stories so I gather I can live with it…until I can’t. One thing’s for certain. It is time for Sekonic to upgrade their light meters, at least the 758Cine. I also believe all future light meters should have accurate in-built color meters. 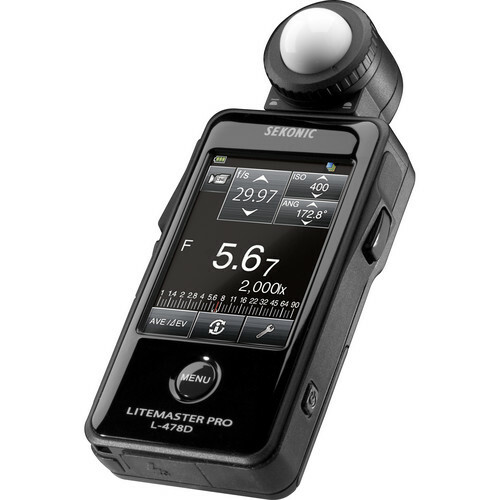 I’d pay $1000 for such a light meter, especially if it is weather sealed and doesn’t have a touch screen! What’s the battery life like on the Sekonic L-478D? The Sekonic L-758 Cine is a very popular meter with Pro DPs, and you’re misjudging it and misleading your readers. Pro shoots rarely go as high as 8000 ISO, that’s for DSLR kiddies. Also, the L-758C has an outstanding 1° spot meter built in, that is far better than the competitors. You can also directly calibrate the meter to your actual camera sensor. The meter can hold several calibrations in memory to help match cameras on a mixed shoot. The batteries aren’t rare. I buy them from Amazon and they get here in two days. I reorder when I replace a battery and the box is half full. I love my L-758Cine. I would buy a new one if Sekonic made an identical meter with a color touch screen. Thanks for the extensive test, but I believe you’ve got it named wrong in the “Contenders” section — the one you are comparing is the Luxi light meter, not the Lumu light meter (which I believe you avoided testing, because of the high price?). In any case — I believe there is an error there somewhere. Let me know if I’m mistaken. Each has its strong points. One is almost always in your pocket, and you can find a durable case for it. From film days (which hopefully aren’t over! ), I have a Spectra IV-A, a Minolta Spot F, and a Minolta Color Meter II. The color meter is also a great learning tool. Not sure what I’d buy today. I don’t object to a screen, so the high end meters would work for me. If I were in the market now, I would question a $1600 Sekonic 700R compared to a $25 app + a $30 dome. If I were a full time gaffer, I would buy the 700R. It might interest you to know that DSC Labs, makers of the Chroma du Monde charts, hired Adam Wilt. At NAB, he showed me his app next to calibrated light meters. It’s impressive. No doubt it is accurate. I just hate the ergonomics of a smartphone with a touchscreen. But it’s ironic because I own the Sekonic 478D which has a touchscreen! Check Cine Meter, and you might consider switching to an iPhone. It’s a great idea, and I’ve been following it for a while. But not very practical in a tough shoot. The Sekonic I have is tough, lasts for months, has buttons, is easy to hold and point, and has a retractable dome. And it doesn’t need firmware updates, or interrupt my reading with a phone call or social media alert. I have the $79 Lumu (now not available) pluggs in via the headphone jack.. (the newer version is MUCH more expensive and I would just get a light meter.) The Cine App II is great. It works like a dream, however you already guessed the issues. On my iPod Touch I have to remember to turn off wifi, bluetooth. Turn app into battery saver mode. But last couple of updates to iPod Touch iOS has dramatically dropped battery power. I keep wanting to get the Sekonic 308DC or Sekonic 478. I used Sekonic 308 years and years ago.. bullit proof (well practically) but no special features like filter factors… so I would have to do the math in my head. OR Sekonic 478 with the largely disliked screen but the features I think I want. Maybe if I picked up a used iPhone for better battery life and not hooking up to cellular system to keep it just a better iPod type of device. I keep hoping a new improved version of the 308 or 478 will come out by the time I give up and am ready to spend money on one. Hi. I have a 478d and its great. The touchscreen is not a problem at all. Its even better because all the functions are easily available and not hidden in menus. Change a setting takes 2 seconds. The only thing that i found strange is that working with the BMCC it measures too dark. I can always open the lens without overexposing. I suggest you to take a look at LxMeter app for Android and its SS04 add-on sensor. It works also with flash lights.